NNVC is running again today, this time apparently in response to a very bullish write-up in Agora's Breakthrough Technology Alert and possibly as the result of a mention on Fox Business News. 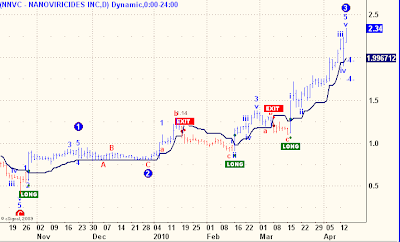 In any case, the EW (Elliott Wave) count has changed on the Weekly chart, now suggesting a target of $5.00 for this move. Go NNVC, and go Wings! Thanks Allan, can you please shed some light on the chart for me? i notice the two number 4's on the chart and assume they are for a wave 4 down. is the new $5 target likely to be hit before or after a wave 4 retracement. NNVC has moved a lot already so a move to 5 from here with no pullback would be a huge parabolic move? The "-4-" wave labels are really without much import, as they are suggestions as to where a Wave 4 might retrace IF a Wave 4 were to start today. 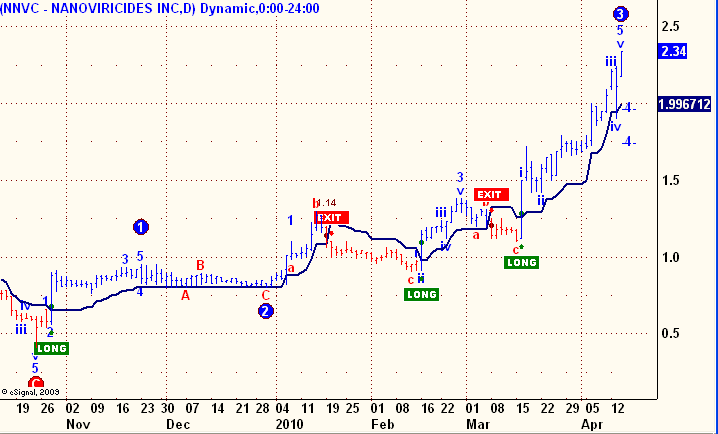 As you pointed out, NNVC could run all the way to 5 before any meaningful pullback, or it could pullback at any time. These pullbacks are just not known in advance. Where are all the posters bashing NNVC that it was a nothing company and it was going to zero. I have not read anything from them recently. Guess they left, along with the know-nothings predicting it's going to $5 based on rumors. Did you mean going to $2, Allan?